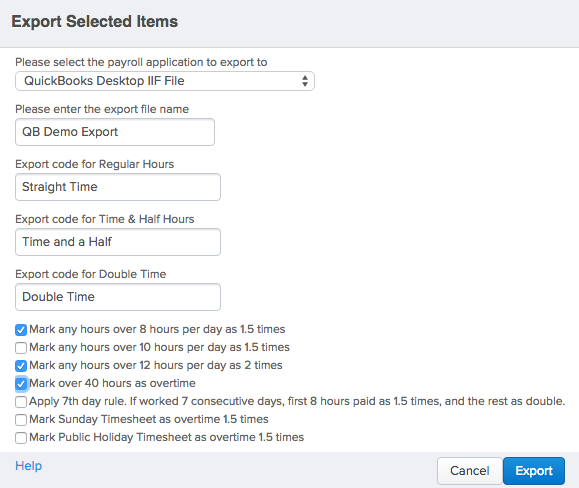 Before you start exporting to Intuit Quickbooks Desktop, you'll need to have approved timesheets for your employees. Only a System Administrator or Location Manager may export timesheets. You may export timesheets from Deputy to Employees and Vendors in Quickbooks. First, you'll need to set up payroll tracking for Quickbooks as per their instructions, shown below. Before exporting, you'll need to match your employees between Deputy and Quickbooks. To do so, make sure their names are the same in both systems. Please note that Deputy doesn't have a middle initial, however you may still use the full name in Deputy. For the employee to match between Deputy and Quickbooks, you must set the Timesheet Export Code in Deputy to match the Employee ID in Quickbooks. This can be a word, a few letters, or numbers. 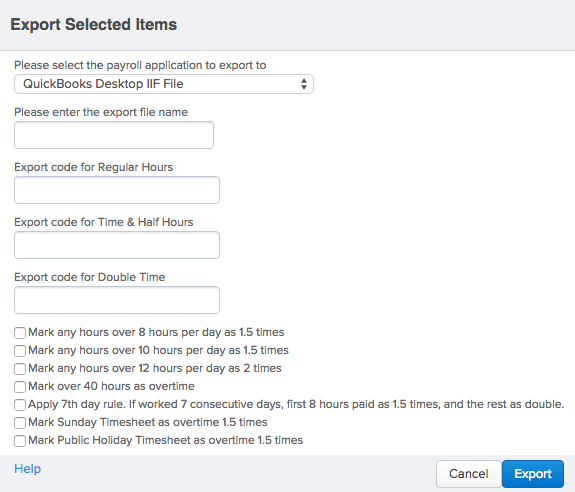 You can adjust the Timesheet Export Code in Deputy by following the instructions here. The Employee ID in Quickbooks can be found by opening the Employees tab, then double clicking the employee in the list. You will see the employee profile appear. Click the Additional Info section and you will see the option to set it, as shown below. While editing the employee in Quickbooks, please navigate to the Payroll Info section. You will need to turn on the option named "Use time data to create pay checks". 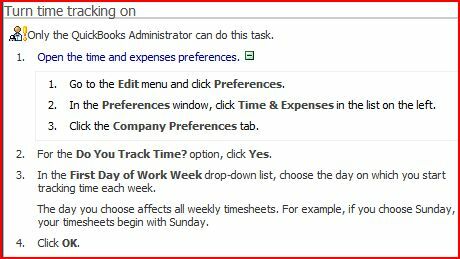 Turning this on will allow you to use timesheet data to create pay checks in Quickbooks. 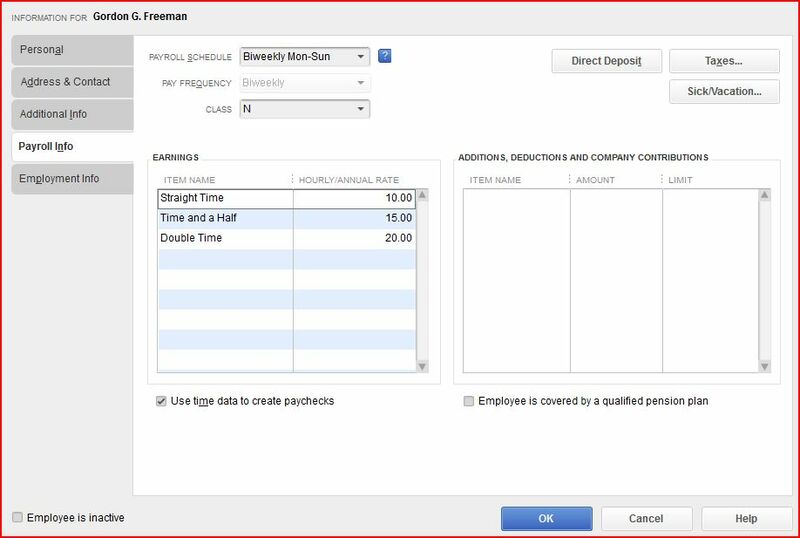 Here you should also set up the employee's Payroll Schedule (this controls their pay dates in QB) and their Earnings Items. Deputy can output to straight time, time and a half, and double time. We suggest using the same items for each employee, which will multiply based on their straight time rate. It's important to use the same items for each employee if possible, as this will allow you to export the maximum number of employees as shown later in the article. An employee correctly set up in Quickbooks should appear as below. In Deputy, you'll need to make sure the employee name matches with the Vendor name in Quickbooks. You'll then be able to export with no issues. If you're assigning time to a particular Customer in Quickbooks, you'll need to make sure your Area Export Code in Deputy matches the Customer name. You can set the Area Export Code in Deputy by following the instructions here. Please navigate to the Timesheets tab at the top of your screen and select "Export Time Sheets". Select the date range for the export from the date selector at the top of screen. Please make sure this aligns with the period you'd like to pay staff for in QuickBooks. Please click the employees to export on the left hand side. To quickly select all employees click "Select All". The details will then be displayed on the right hand side. You can select or deselect items by clicking the checkbox next to them. To export, please click "Export Selected Items", which will display a menu asking you to select the payroll application. Please click the down arrow to display all options and select "Quickbooks Desktop IIF File". Next, add in your Straight Time, Time and a Half, and Double Time rate names in the box below (we recommend using the options as named).You will then see a list of overtime options appear below. Please tick those that apply to your business. Finally, please press "Export" to create your file. Great work! The final step is to upload the file to Quickbooks. To do so, please follow their instructions here.